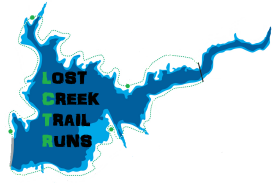 Lost Creek provides a wonderful singletrack experience that is a little easier to follow than many remote ultramarathon courses. The Course is permanently marked with metal arrows. Leaving the start/finish area turn right on Hwy 62. Drive 4.8 miles and turn right on Takelma Drive. Around 2 miles Tekelma turns to gravel, keep going another 3.5 miles on the gravel until you see the aid station sign. Park along road and walk down to the aid station and wait for your team member. Make sure to watch for runners when driving on the gravel. Make sure to give yourself 20 minutes for drive time.